Updated 3BR Beach Block Condo - 50 YARDS TO THE BEACH!!! Cool and Convenient 3BR beach block condo - only 50 Yards to the Beach! Come stay at our renovated home at the shore! Our condo has 3 bedrooms and a large bathroom (with a double vanity). Highlights include…a new granite/stainless kitchen, new tile floors throughout, new double vanity, new air conditioners, new ceiling fans, new dining furniture, new TVs in every room (except the bathroom) and direct access to on-sight laundry (coin-op)! FREE Wi-Fi too! 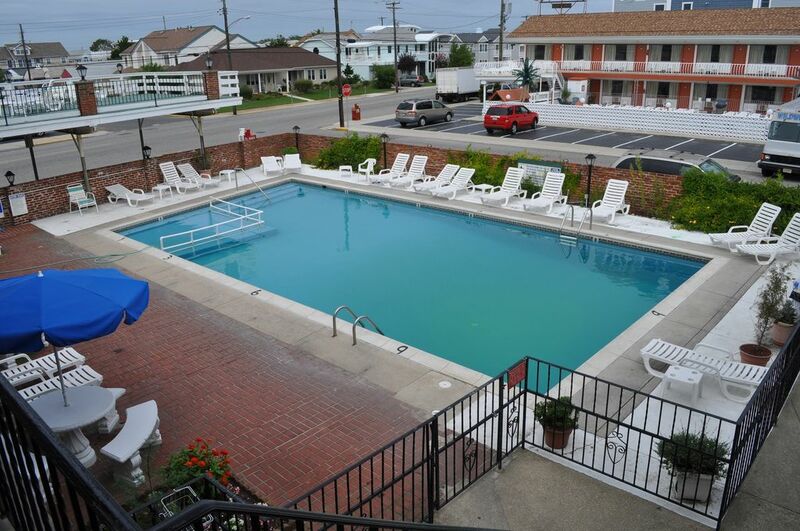 It's the largest unit in the complex, and is a very short distance to the beautiful beaches of Wildwood Crest! Also for our guests' use are a 'pack n play' and a high chair. You DO have to bring your own sheets/linens, but 2 beach umbrellas and 6 chairs are provided. And all rentals will be from Saturday to Saturday. The Carriage Stop condominium complex offers a large pool, a big sun deck with ocean views and a patio area with grills on the premises. Please take a moment to read some of our 'Guestbook comments' below. Enjoy your stay! toilet, combination tub/shower, New double vanity makes the most of the space! Had everything you could ask for and more!! My grandsons especially enjoyed the pool. The pool even had a toddler section within the pool. We would definitely rent this condo again!! The unit was in great condition, nicely decorated and well supplied, including paper goods and beach equipment (and a beach buggy). The three nice-sized bedrooms with queen beds were perfect for our family of 3 couples. Owners were very responsive and accommodating. Providing a relaxed beachy atmosphere is our goal for renters of Unit M. By supplying big items such as beach chairs and umbrellas, boogie boards, toys, a beach cart and a cooler, renters have less to pack in their cars as they venture down to enjoy the beautiful Wildwood Crest beaches. The property was clean and the owners made us have a smooth transition with the information they sent us via email. We never had to call them for anything. They supplied dishes, toaster, coffee maker vacuum, brooms and even a wash cloth. They also supplied paper towels and toilet paper which was great!! They also supplied beach umbrellas, beach cart and chairs as well as things young kids could play with in the sand at the beach. They were more than accommodating and we enjoyed our vacation very much with no worries. We aim to please our renters by supplying a variety of beach chairs, umbrellas, boogie boards, and beach cart/toys.Having all the comforts of home at one's disposal makes a week at our beautiful Wildwood Crest beach condo carefree. Whether guests prefer the heated pool or the white sandy beach of the Atlantic and accompanying warm ocean breezes, Unit M at Carriage Stop Condominiums is the place to be at the Jersey shore. Ever since we discovered this place it has been our vacation secret, we love to come here every summer! We love being in diamond beach area of Wildwood. The kitchen is spacious and well equipped and the bedrooms are clean and spacious and have a TV in each of them. The best part is a big heated sault water swimming pool that is rarely crowded. We couldn't find a better pool around. The town trolley is around the corner. The owners are pleasure to deal with. Highly recommend. Delighted to know that our efforts to provide our guests with a pleasant venue convenient to the beautiful Wildwood Crest beaches is appreciated. A vacation should be enjoyed stress free. Adorable Condo! Great location, seconds away from the beach. Kids loved the fact that each room had a TV. Would definitely rent again! Adorable condo less than a block from the ocean! Great 3 bedroom condo with beach chairs and cart for transport. Corner unit was a little dark without many windows, but spacious enough for 5 of us (easily could have slept 8). Walked back and forth from ocean to pool everyday and rarely was inside for long! AC units in every room with ceiling fans.There were three grills and outdoor seating for lunches or dinner outside. Down the street about 3 blocks were two breakfast spots. outdoor shower for sandy feet. Couldn't ask for more and the price was very reasonable. Owners are super nice and responsive by email. 3BR beach block condo - ONLY 50 YARDS TO THE BEACH! Our home has 3 bedrooms and a large bathroom (with a double vanity), and was renovated a few short years ago. Highlights include…a granite/stainless kitchen, tile floors throughout, double vanity, air conditioners, ceiling fans, dining furniture, TVs in every room (except the bathroom) and direct access to on-sight laundry facilities (coin-op)! It's the largest unit in the complex, and is a very short distance to the beautiful beaches of Wildwood Crest! The Carriage Stop condominiums offer a large pool, a big sun deck with ocean views and a patio area with grills on the premises. Please feel free to ask owners any and all questions at any time!